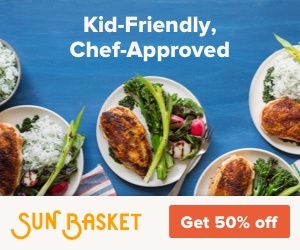 Short on time and want to skip ahead? 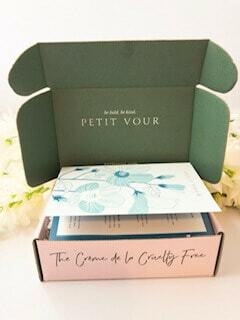 Use code FAB25 to get 25% off your own Petit Vour Clean Beauty Box Subscription! I remember when I started wearing makeup and most of what my friends and I bought was from the drugstore. We weren’t concerned with what was in those products, because we didn’t know and the manufacturers weren’t telling us. Flash forward to today and we know a heck of a lot more about all the toxic chemicals and cruel animal testing practices that go into those beauty, skin care and hair care products. 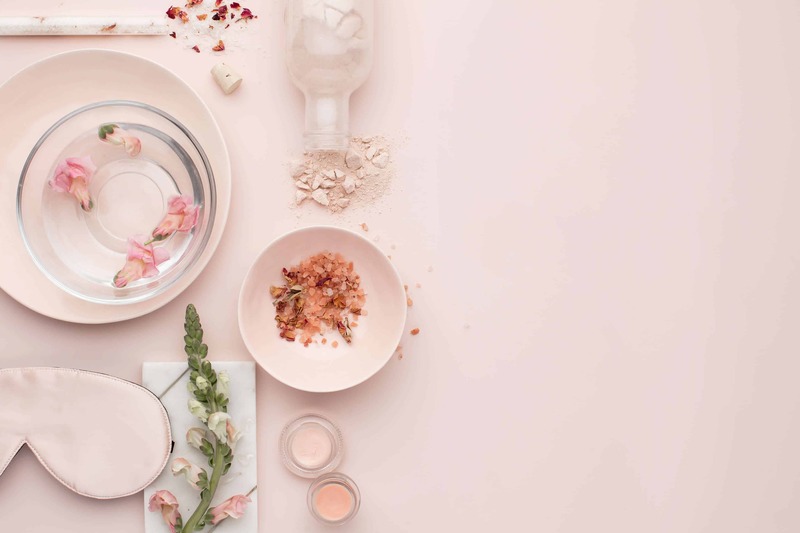 Luckily, thanks to the increasing awareness, more vegan, cruelty-free and clean beauty companies have been established and are changing consumer’s expectations for what should be in a product we are rubbing all over our face and body. Affordable, clean beauty products are more accessible than ever. 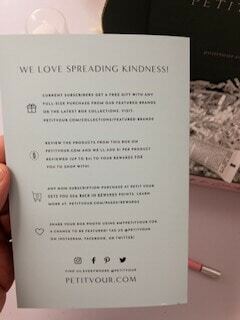 Especially with clean beauty box subscriptions from companies like Petit Vour. I’m so grateful to Petit Vour for partnering with me on this post. Please know that if you choose to order a Petit Vour box, I’ll receive a small commission at no cost to you – in fact, you’ll save money with my code: FAB25 – which gets you 25% off!! 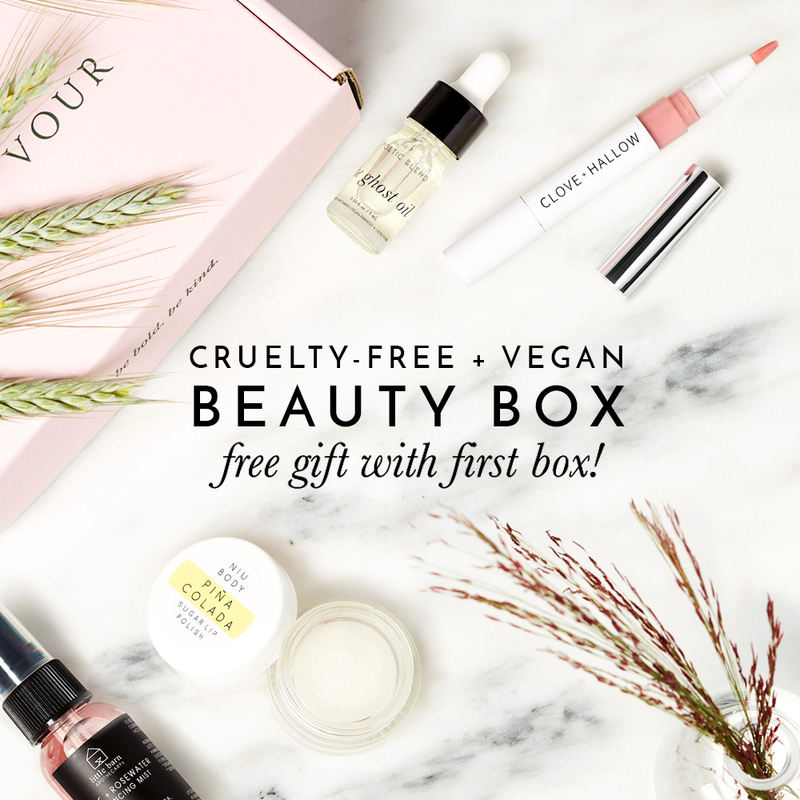 Petit Vour is THE clean, vegan, cruelty-free beauty box subscription and shop. 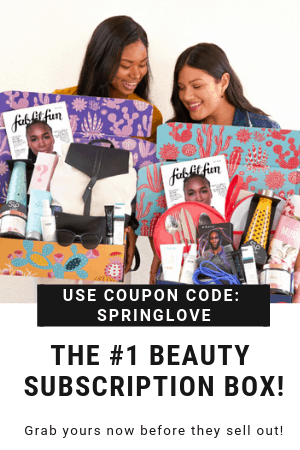 With the beauty box, you get an adorable little box of 4 clean beauty, plant-based goodies curated to your beauty profile each month for a very affordable price. 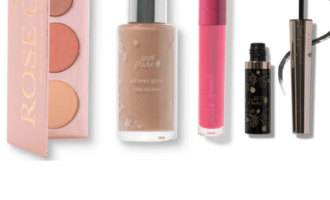 Plus, you get 20% of what you spend on your box back each month in PV points if you write reviews on the products in the box. You can use your PV points in their clean beauty shop to get more great merch. Their shop is amazing. You really have to check it out. 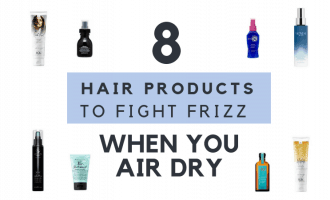 The breadth of products and brands that they carry is incredible. Talk about feeling like a kid in a candy store. I want everything. 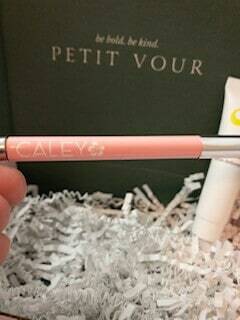 Speaking of which, the April Petit Vour box had some fun, new finds – and I am excited to share them with you today! I love a good mask. That’s why I’ve written about quite a few of them before. 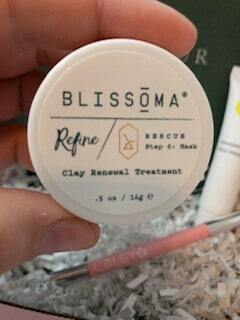 I can’t believe this totally clean, clay mask is so affordable. It has a really nice, cooling sensation. Dries nice and smooth and rinses off clean. My skin definitely felt softer and had a nice glow. Plus, it didn’t have any awful fragrances or unpleasant smells. Big win. The little container in the box has about 2 masks worth of product, so that’s a good size sample. This serum feels so good. It is chock full of antioxidants like reservatrol and hyaluronic acid. Y’all know my deep love for hyaluronic acid, so I was all about trying this one. It has a creamy, smooth consistency without being sticky. I apply it underneath my daily SPF and it helps protect skin from free radicals. Yes. 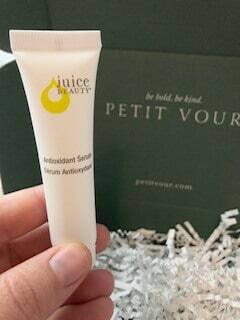 Juice Beauty just gets it right. 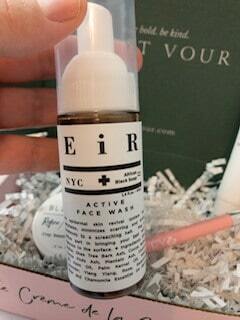 They have a face wash that came in my March Allure Beauty Box and it is also totally amazing, too. Both absolutely worth purchasing again when my samples are used up. This is a unique face wash designed to take down bacteria causing blemishes and acne. I can see how it would be effective, with powerhouse ingredients like castor oil. It has a dark brown color to it, so I’m glad I used it in the shower to wash my mask off. While this isn’t a mask I personally need right now – the ingredients are a good, clean way to help blemished skin. I’ve never had an issue with my eyebrows. Years of waxing in my early 20s has left my brows pretty much the same for about ten years – with no effort. I might tweeze a few random hairs every few months, but the hair has pretty much stopped growing. However, in the last couple of years, I have noticed them thinning – which bothers me. That’s where these natural brow pencils come in handy. This one has a nice feel to it and wears well, but it was the blonde color – which is too light for my hair. It made a great gift for my fair-skinned cousin, though, who loves it. All in all, a great little box of clean beauty. I used all the products one morning like a little routine and my skin felt great after. Definitely worth the price of the box. They also give you this little card that shares all of the ways you can earn free gifts, credits on merchandise from the shop, and more. Talk about sharing the love. 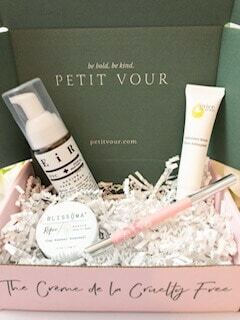 You can get your own Petit Vour beauty box for a steal – especially if you use my exclusive coupon code – FAB25 for 25% off your first box!! I can’t wait to see what is in the next box. 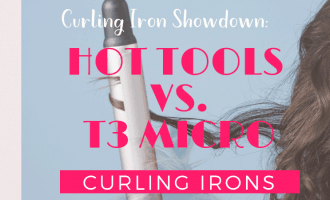 Be sure to reserve your own so we can compare notes on the products together. Or, if you act fast, you can still get your hands on the April box. P.S. Don’t forget to use code FAB25 for 25% off your Petit Vour box.